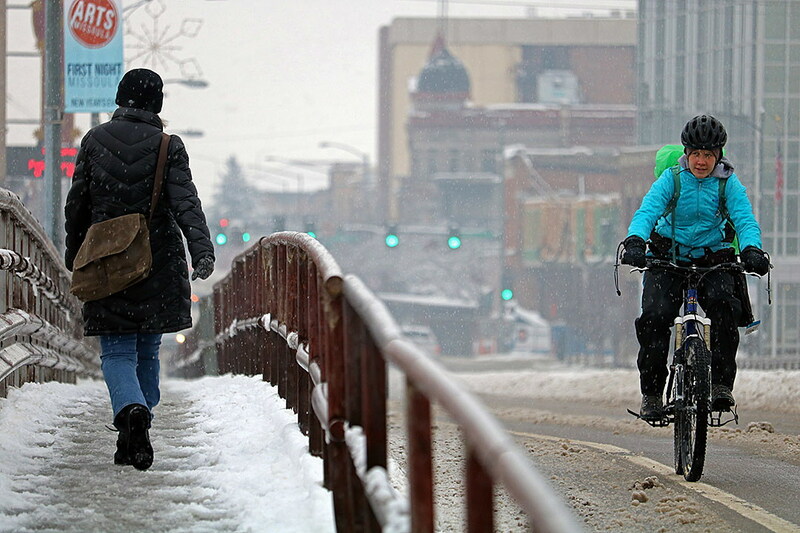 An estimated 6 percent of residents in the Missoula urban area walk or bike to work or school, a figure that places the city well ahead of the state and national average. But it’s still less than the stated goal of 18 percent, according to a draft of the Pedestrian Facilities Master Plan, unveiled Wednesday before members of the Missoula City Council. The City Council requested the plan back in 2017 as part of a larger effort to improve pedestrian connectivity and prioritize needs. Making it easier to walk or bike around the city could cut the use of single-occupancy vehicles, reducing traffic congestion as Missoula grows. That, advocates contend, benefits everyone. According to the plan, the Upper Rattlesnake, South 39th Street and the Two Rivers neighborhoods are missing the most sidewalks. Marshall Canyon and the University District have the most complete sidewalk network. Add it up and Missoula is missing between 200 and 300 miles of sidewalk. But Wilson said the figures can be misleading if not placed into context. Over the last five years, according to the plan, the city has completed three miles of sidewalk each year at an average cost of $1.2 million. But Wilson said the cost of installing sidewalks has risen sharply and now stands at around $1 million per mile. At the current rate of investment, he said, it would take 200 years to meet the current need. “It highlights the need to have impactful investments and really prioritize the highest benefit projects,” he said. The cost of installing and replacing sidewalks led the city last month to cancel a project in the Slant Street Neighborhood. It also prompted the city to request the Pedestrian Facilities Master Plan back in 2017 when questions over costs and equity first became an issue. Two years later and those concerns haven’t subsided. But improving pedestrian and other non-motorized facilities may cost far less than building roads, advocates say. It could also cut traffic. Given the limits of the annual budget, the study recommends targeting sidewalk investments in certain areas. Priorities were identified using a number of metrics including poverty, health, social equity, growth, crash data, and public demand for greater connectivity. The West Broadway corridor, the Northside neighborhood and Mullan Road west of Reserve were top priorities, along with neighborhoods along Reserve Street and Target Range. The draft plan could be adopted by the Transportation Policy Coordinating Committee next week. Members of the City Council have asked for a deeper breakdown of costs. “This plan really allows us to prioritize public dollars and be good stewards of public dollars and leverage those to the maximum benefit possible,” said Hess.